In keeping with our tradition of making high quality roofing products Epilay is now planning to introduce in April/May 2017 our unique Peel & Stick Underlayment for use as Ice Barriers. It will have all the same features of our regular underlayment with the GripWalk Walking Surface, a strong SBS modified bitumen based adhesive and an easy to install split release film. Having a wide temperature performance range (High Temp) it is one of the most unique products of its kind. It will be available in 3’ x 66.7’ rolls (2 square rolls). With its phenomenal success in the Epilay Weathertite Roofing Underlayment products, now Epilay is about to launch its latest version of energy saving Radiant Roofing Underlayment. It serves the dual purpose of a waterproofing surface as well as a radiant barrier so there is no need to put an extra layer of radiant foil. A radiant barrier can be an extremely effective way of reducing heat gain in your home and increasing energy efficiency. Installing radiant barrier between the shingles and the roof deck without any air gap will not help and will actually increase heat through the roof. What you need to do is create an air space between the Epilay Radiant Roofing Underlayment and the roofing material. Some roof types, like standing seam metal roofs and barrel-type roofing tiles, naturally have an air space between the roof deck and the roofing material. You can also use wood battens to create the necessary space. After you have covered the roof deck with Epilay Radiant Roofing Underlayment, simply install the battens according to the installation instructions. 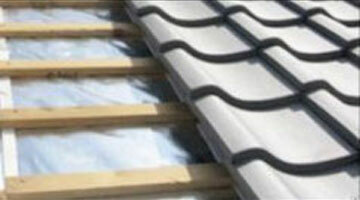 The roofing material can then be attached over the battens, maintaining an air space between the foil and the shingles. To allow for maximum airflow, leave spaces between the battens.